Ship dismantling, also commonly referred to as ship “recycling”, is an inherently sustainable activity, the benefits of which are felt at the global level. As the term ship “recycling” implies, value is derived from the materials and equipment comprising end of life ships: the scrap steel is melted down and is commonly used in the construction industries of ship recycling countries, and equipment (engines, mechanical parts or furniture) is refurbished and reused in other industries. 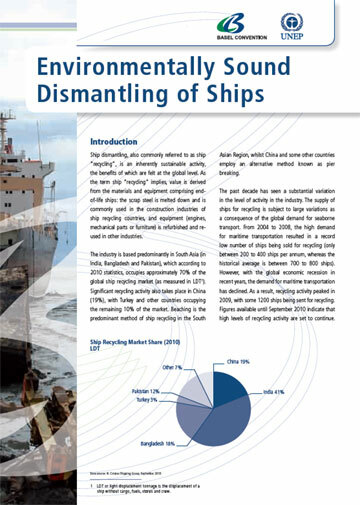 The industry is based predominantly in South Asia (in India, Bangladesh and Pakistan), which according to 2010 statistics, occupies approximately 70% of the global ship recycling market. Significant recycling activity also takes place in China (19%), with Turkey and other countries occupying the remaining 10% of the market. 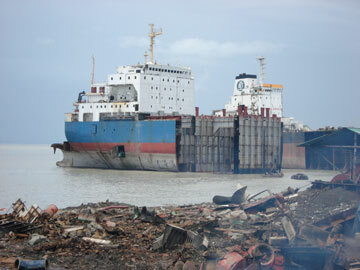 Beaching is the predominant method of ship recycling in the South Asian Region, whilst China and some other countries employ an alternative method known as pier breaking. The past decade has seen a substantial variation in the level of activity in the industry. The supply of ships for recycling is subject to large variations as a consequence of the global demand for seaborne transport. From 2004 to 2008, the high demand for maritime transportation resulted in a record low number of ships being sold for recycling (only between 200 to 400 ships per annum, whereas the historical average is between 700 to 800 ships). However, with the global economic recession in recent years, the demand for maritime transportation has declined. As a result, recycling activity peaked in 2009, with some 1200 ships being sent for recycling. Figures available until September 2010 indicate that high levels of recycling activity are set to continue. 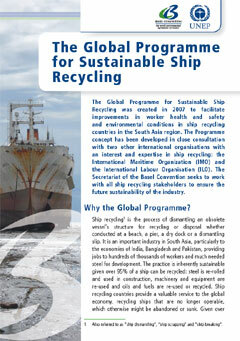 The Global Programme for Sustainable Ship Recycling was created in 2007 to facilitate improvements in worker health and safety and environmental conditions in ship recycling countries in the South Asia region. The Programme concept has been developed in close consultation with two other international organisations with an interest and expertise in ship recycling: the International Maritime Organization (IMO) and the International Labour Organisation (ILO). The Secretariat of the Basel Convention seeks to work with all ship recycling stakeholders to ensure the future sustainability of the industry. Ship dismantling, also commonly referred to as ship "recycling", is an inherently sustainable activity, the benefits of which are felt at the global level. As the term ship "recycling" implies, value is derived from the materials and equipment comprising end-of-life ships: the scrap steel is melted down and is commonly used in the construction industries of ship recycling countries, and equipment (engines, mechanical parts or furniture) is refurbished and re-used in other industries. Concern has been expressed at the international level over the environmental, health and safety standards in this industry, particularly in those countries employing the beaching method of ship recycling. Ship recycling commonly takes place in developing countries which tend to have a competitive advantage as they provide a pool of low cost labour, may have weaker environmental protection / worker health and safety regulations, and have national demand for the outputs of the activity (predominantly scrap steel). Poor enforcement of regulations relating to this activity means that problems with local environmental pollution are commonplace and incidents of worker injury and fatality are high. These concerns are compounded given the upward trend in recycling activity experienced in the past few years. The Basel Convention has been involved in this issue for over a decade. This activity is of particular concern in the Basel sense as end-of-life ships comprise of an array of hazardous materials – such as asbestos, PCB and waste oils – which can have serious implications for the environment and human health if not managed properly. As ships destined for dismantling will rarely fly the flag of the state in which they are to be recycled, this activity can represent a transboundary movement of hazardous waste. However, given the global nature of the shipping industry and the practices associated with sending end-of-life ships for recycling, there has been difficulty in applying the provisions of the Basel Convention to ship recycling. Parties have recognised that Basel controls may often be circumvented for ships going for recycling. Thus at the seventh meeting of the Conference of the Parties in 2004, while Basel Parties recognised that ship may become waste as defined in Article 2 of the Basel Convention, they also invited the International Maritime Organization (IMO) to continue work aimed at the establishment of mandatory requirements to ensure the environmentally sound management of ship dismantling (decision VII/26 on Environmentally sound management of ship dismantling). The Hong Kong International Convention for the Safe and Environmentally Sound Recycling of Ships was adopted at a diplomatic conference in Hong Kong, China, in May 2009. The Convention elaborates in its articles and regulations a control system for ship recycling, which includes obligations for flag States and shipowners and recycling States and recycling facilities. In May 2010, the seventh session of the Open-ended Working Group welcomed the adoption of the Hong Kong Convention (decision OEWG-VII/12 on Environmentally sound dismantling of ships). Subsequently, in October 2011, the tenth meeting of the Conference of the Parties encouraged parties to ratify the Convention to enable its early entry into force. COP 10 also acknowledged that the Basel Convention should continue to assist countries to apply the Basel Convention as it relates to ships (decision BC-10/17 on Environmentally sound dismantling of ships). For a complete list of COP and OEWG decisions related to ship dismantling, including information received from Parties and others pursuant to the abovementioned decisions, please click here. For information on ship wastes, specifically the relationship between the Basel Convention and the International Convention for the Prevention of Pollution from Ships (the “MARPOL” Convention) please visit the Waste from ships section of the website.